Methodism in Rice County dates back to 1870 when Sterling was known as Peace. The first official recognition of the Sterling Church by the Methodist Conference was in 1874, and Rev. J. A. Vickers was appointed pastor. Services were held in various temporary locations and in 1877, with Rev. H. W. Conry as pastor, the Sterling Methodists built their first church at the corner of Main and Eighth Street. In March of 1878, a charter was granted to the First Methodist Episcopal Church of Sterling. During 1881 the mortgage on the church building was paid and the Methodists were free of debt. In 1882 a committee was named to build a parsonage at 119 North Eighth Street. Up until 1883 Sterling was in the South Kansas Conference but at this time the name was changed to the Southwest Kansas Conference. Discussion about building a new church was begun in June of 1897. Trustee’s minutes record considerable talk but no action. Certain necessary repairs and additions were made to the first building from time to time including a walk and steps with money raised by the Ladies Aid Society. December 1899 brought more discussion of the need for a larger building. Ground was broken on August 1, 1900 at the church’s present location. Original plans called for spending $6,000-$7,000, but the estimate was too low. On dedication day, November 26, 1901, fifteen hundred people were present and 299 personal made contributions of $3,600 in the morning session and $600 additional at the afternoon and evening sessions. 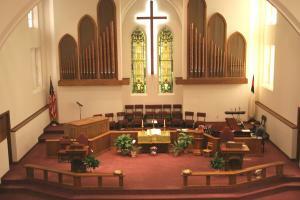 A pipe organ was included in the building fund and the total cost of the church and organ was about $15,000. In February 1909 the “I Will” Sunday School class was organized and the “Who Do” class in 1914. A new parsonage was built at 217 North Seventh in 1913. The Annual Conference records of 1916 show that the pastor received the parsonage rent free and a salary of $1, 900 per year. Church reports show that following the building of the new church the congregation soon doubled in attendance; the Epworth and Junior League took on new life and the Sunday School grew in numbers and strength. A gracious revival followed and many became Christ’s witnesses. A gift made possible the building of an attractive addition to the church, providing a church office, pastor’s study and classrooms on both the ground floor and second story. The new addition was dedicated in the late fall of 1932. In 1936 a new organ was purchased (retaining some of the old pipes) at a total cost of $2,100. 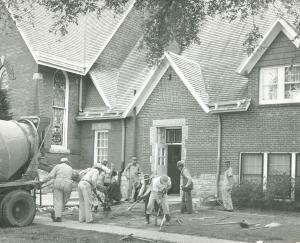 More Sunday School classrooms were soon needed and the kitchen needed remodeled so the men of the church dug out under the sanctuary to enlarge the basement for more rooms and two restrooms. The women bought all the equipment for the kitchen. The work was finished in March 1938. The following the year the sanctuary was redecorated. 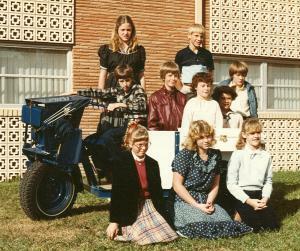 The “Gleaners” Sunday School class was organized in 1940. 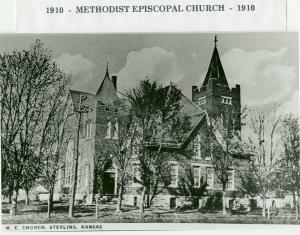 During this period the Northwest Kansas Conference, Methodist Episcopal Church and Kansas Conference of the Methodist merged and became the Central Kansas Conference of the Methodist Church. 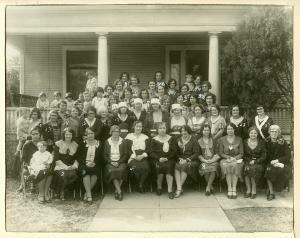 The ladies groups joined the WSCS (Women’s Society of Christian Service) and the business ladies were called the Guild. Franklyn Edwards was pastor at the Sterling Church during the World War II years. He and the WSCS women wrote to youth from the community in the armed services. The WSCS gave a New Testament to each young person as he or she left home and letters were sent to 96 young people. In 1944 a new Sunday School class was organized which was called “O.U.R.” The lots to the south of the church were purchased in 1945 for $265. In 1946 a social visitation program was implemented which resulted in 50 new members. Open house was held at the parsonage in December 1947 for members and friends of the church to inspect the newly decorated rooms. Hosting the event were the current pastor, Rev. L.R. Templin, his wife and daughters. During his tenure as minister he recommended the construction of an annex for educational and social purposed. Organizing and updating membership rolls and monetary giving was undertaken in 1950. Young married couples organized a new Sunday School class calling themselves “Kum-Joy-Nus”. 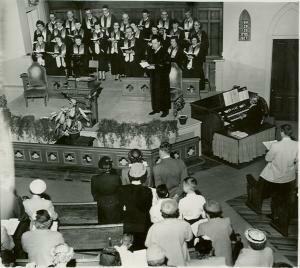 May 6, 1951, a rededication service of the church sanctuary was held. The organ pipes, floors, pews and pulpit had been refinished, the walls and ceiling painted and carpet laid. A new altar rail had also been given as a memorial. In January 1952 the working women of the church organized The Wesleyan Service Guild. The Rev. Carl Eklund organized Wednesday evening Bible studies soon after he came in 1951. Members responded to a need for clothing in Korea and two large shipments were made. A building fund was underway for a future educational building and during the time of Rev. Paul Mundell the building finance committee was very active obtaining cash and pledges amounting to $67,000. The building plan was presented and accepted on January 3, 1961. An additional $18,000 was received in pledges and construction began August 15. It was consecrated on June 24, 1962. Rev. 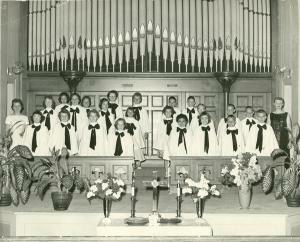 Roxie Powell’s wife organized the first junior choir in 1956. At the October 1968 official board meeting the Rev. Philip Chastain reported on the uniting of the Evangelical United Brethren Church and The Methodist Church and that the new name would be The United Methodist Church. The conference would be known as the Kansas West Conference. Property was purchased directly north of the church for a parking lot. In June of 1969 the church exterior was restored and in November the church celebrated its 95th anniversary. Broadcasting of the Sunday morning services over KLOQ radio was begun in 1970. Rev. Edward Rowley came in 1972 and a year later instituted a “Morning Celebration” at 8:30 a.m. Mrs. Rowley directed the High School Folk Choir. A Lay Witness Mission was held in October and was the beginning of a number of small groups. The 100th anniversary celebration took place on October 27, 1974. The previous year the WSCE and the Guild reorganized and became the UMW (United Methodist Women). 1976 brought a new minister, Rev. Robert Baer and Brian Detter, youth minister and Crossfire Singers director. In later years successful programs were at work in many areas of the local church. For several years work trips were taken to Lydia Patterson Institute in El Paso, Texas, a mission in Juarez, Mexico, and McCurdy School in Espanola, New Mexico. In 1981 a congregational vote was taken to build a new church. The vote was split so closely that the matter was tabled for seven years. Rev. John Martin began service at the church in 1983. The work trips continued and the church was very active in the local food bank. We continued to have help with the youth from Sterling College students. In 1987 the decision was made to hire a full-time Youth Director. The church would soon be looking at a major renovation project and the minister leading this venture was Rev. James Graves. 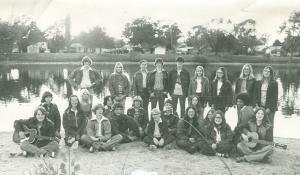 The Youth Director position was filled in June 1989 by Steve Johnson. Planning for the building project took place in 1990 and the sanctuary was closed in December of that year. The $860,000 remodeling consisted of tearing off the 1932 addition west of the sanctuary, filling in the basement, lowering the main floor and placing the altar at the east end rather than the west. 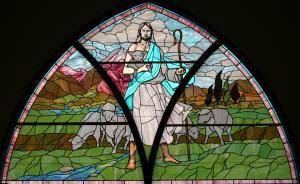 The beautiful stained glass windows were protected during construction. A large additional stained glass window was installed in the north end of the second floor. The finished sanctuary, enhanced by the 30-foot arch over the altar area, and the refurbished organ, additional rank of pipes, new pulpit crafted to match the lectern all combine to make worshipping an inspiring experience. New padded pews in mauve, matching the carpet, add a restful color. The foyer, an elevator, restrooms and additional classrooms added in the renovation provide high quality facilities. The first service was held on January 19, 1992 and the consecration service was on February 23. New hymnals, purchased in 1989 were followed with pew Bibles in 1996. During the 1990’s new programs included: The “Afterschool Club” on Wednesdays for young children and Sunday School classes, “Contemporary Issues”, “Open Door”, “His Pilgrims” and “20-Something”.